Annette Kellerman wants you to experience the cinematic joy of THE DAWN WALL! Some documentaries have incredible subject matter yet somehow fail to achieve an overall cohesive film, while others can take somewhat limited material and make an entertaining and well rounded final movie. I mean, I loved an entire doc about a font for crying out loud, so it can definitely be done. So when a filmmaker is able to combine an astonishing story with superb storytelling, the result is absolute magic. 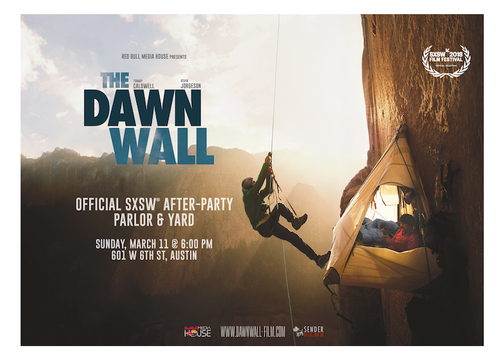 With THE DAWN WALL, directors Josh Lowell and Peter Mortimer combine both stellar storytelling and an amazing topic to create one of the most compelling films- documentary or otherwise- that I’ve seen in a long time. THE DAWN WALL tells the story of free climbing extraordinaire Tommy Caldwell and his quest to climb where no person has before- El Capitan’s infamous “Dawn Wall.” Though many have traversed various other routes up Yosemite’s most famous cliff, The Dawn Wall was never successfully ascended. As this epic undertaking with climbing partner Kevin Jorgeson unfolds, the film goes back and forth telling the stranger-than-fiction events and hardships in Caldwell’s life (Taken hostage in Kyrgyzstan! Losing an index finger!) that have lead up to this historic endeavor. While Caldwell’s self-appointed challenge is obviously daunting, so is the task of capturing it on film. Following the world renowned adventurer for years as he obsessed about his plight to ascend the granite cliff, Lowell and Mortimer were right there with Caldwell every painstaking inch of the way documenting his sometimes questionable efforts to take on the peak. Just when you find yourself holding your breath as Caldwell hangs on a cliff side with nothing but finger and toe tips grips, you suddenly realize, SOMEONE IS UP THERE FILMING HIM! While the filmmakers “only” repel down to capture these amazing images, it is still an incredible achievement in cinema. The cinematography is totally breathtaking as the directors make triumphant effort to show a bird’s eye view of the climber clinging to El Capitan thousands of feet from the ground. This is definitely not a movie for those uneasy with heights. The directors also make a valiant effort in explaining the terminology, techniques, etc in the world of free climbing. There’s actually quite a bit of technical jargon that has to be explained in order for the audience to fully grasp what all goes into an average climb- much less one of such epic proportions. Lowell and Mortimer aptly use illustrations as well as expert commentary to fill in these blanks without losing anybody’s attention. In another brilliant sequence, the co directors smartly employ the use of stylized illustrations to help depict Caldwell and friends’ harrowing tale of being captured and held hostage in Kyrgyzstan. Along with insane archival footage they were able to obtain of the actual kidnappers, the simple and stark animation style they chose strikes the perfect emotional chords to accurately explain the life or death situation. By the time the film finally gets to the most challenging parts of the climb, the gravity (I feel like everything is a pun in this review) of Caldwell and Jorgeson’s investment in this endeavor is totally understood. Though they are always safely tethered to the cold rock, seeing them camped out side by side up in the air on the side of the cliff for weeks on end naturally adds to the tension of an already perilous task. Along with the physical obstacles the pair must overcome, an almost bigger part of the story is their dedication and friendship to one another that many elite athletes in a competitive world just don’t have. If you followed their much celebrated story, you already know the final outcome, but the film completely drives home the fact that, as always, the satisfaction is in the pursuit itself. As the mounting pressure of each nail biting situation gives way to hard fought triumph, the elation is so terrific that my festival audience burst into spontaneous applause- and that wasn’t even at the summit. I simply cannot wait for everyone to see this film and experience the cinematic joy that I did. 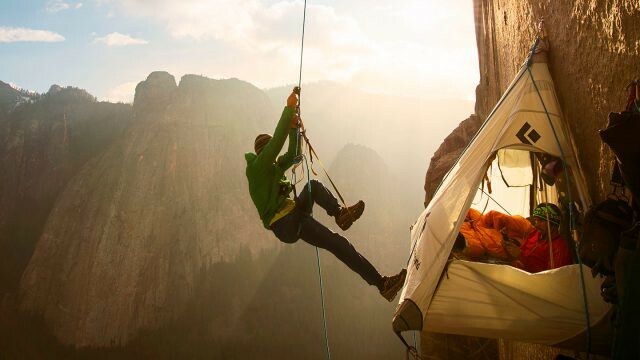 It’s so fun to come out of a film feeling as though you yourself just went on an epic journey, and THE DAWN WALL achieves this while also infusing the story with humor and humanity. Go see it as soon as you can!